I have enjoyed a fondness of sea turtles for years and each time I visit my daughter in Florida, we go to visit the Loggerhead Marinelife Center or the “turtle hospital” as we call it. It is a rather amazing not-for-profit organization that rescues injured and sick sea turtles and with their state-of-the-art medical techonolgies, they help to heal and strengthen sea turtles that were facing death. It’s a fun place for kids and adults alike to visit and learn about these ancient species. On a visit, one can see sea turtles in swimming tanks as they are being treated for their ailments…or, one might see hatchlings that did not make it out to sea after being born for one reason or another. Now, those are really a precious sight to behold!! 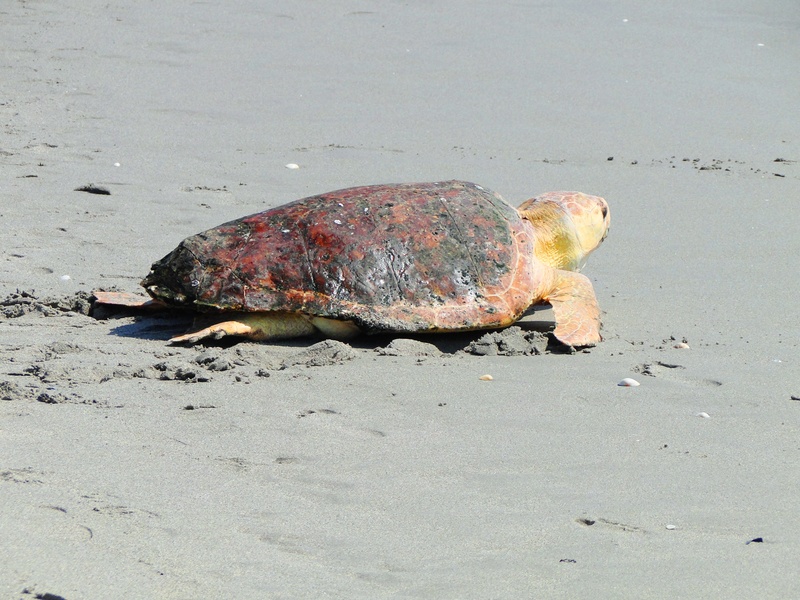 While on my extended stay in Florida this summer, on June 29, 2012, my grandchildren and I were able to observe Tilly, who the center had nurtured back to good health, be released on Juno Beach and to see her instinctively and immediately make her journey back to her home, the Atlantic Ocean. There must have been 200-250 people gathered to witness this great escape back into the wild and all cheered as she disappeared into the blue-green waves of the South Florida sea. So, after Tilly made her way into and under the ocean, the ropes were removed and my grandchildren returned to the waves for play. This time, I liked the thought of them swimming with Tilly in the nearby waves…now what kid wouldn’t want to do that! Jared thought he might have seen her when a big wave came and he saw something brown…or maybe it was seaweed…who knows. But, one thing for certain is this…they all, including Tilly, were swimming in a wonderfully, majestically created expanse of the beautiful ocean created so, so many thousands of years ago. That thought just puts a big, big smile on my face!